Address Plate with Lawn Stakes - - custom address plaque for home or business. Can be ordered with either a one line address (just the street number) or a two line address that includes the street number and a family or business name. Made in USA. 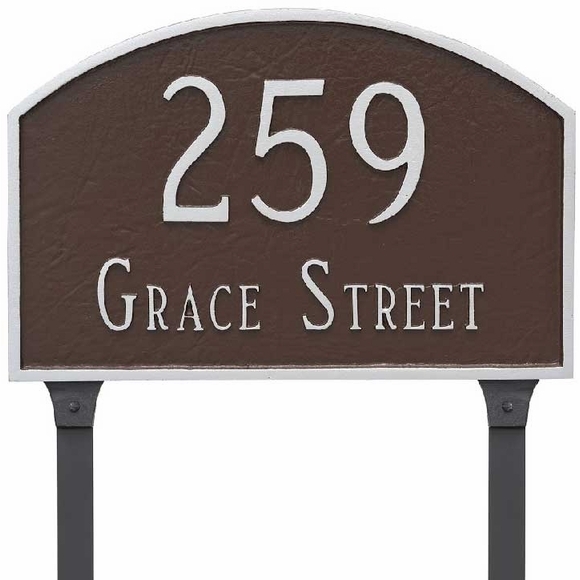 Lawn mount arch sign displays the address number in large easy-to-see characters and comes in two sizes: standard 15.5"W x 10.25"H and large 21"W x 12"H.
Personalized with the home or business address you supply and color scheme selection. Standard one line sign holds up to five (5) 4" characters. Standard two line sign holds up to five (5) 3" characters on Line 1 and up to seventeen (17) characters on line 2. Large one line sign holds up to four (4) 5" characters. Large two line sign holds up to five (5) 4" characters on Line 1 and up to seventeen (17) characters on line 2. Rust free solid cast aluminum construction. Characters and border are integral parts of the sign, not added on. Click top link in Related Products for the wall mount version of this sign.